Ophiuchus is a little known but important constellation, which graces our evening skies in the summer. Ophiuchus is a fairly large and rambling constellation, but it is one of the least well-known. Although Ophiuchus does touch the elliptic — the path that the sun appears to take through the sky — astrologers for centuries ignored it as part of the Zodiac. The constellation finally got some respect in 2011 when they added Ophiuchus as an astrological sign and realigned the Zodiac calendar. Best viewed: In July around 9 p.m.
Ophiuchus contains the second closest star to Earth — Barnard's Star — about 6 light-years away. The red dwarf star is a magnitude 9.5, making it a challenge to find with the naked eye. Delineating the head of Ophiuchus, Alpha Ophiuchi is an A-type giant. The star is also known by the name Rasalhague, meaning "Head of the Snake Charmer" in Arabic. Two stars — Eta Ophiuchi and Zeta Ophiuchi, a hot blue giant that has a reddish appearance because of interstellar dust — mark the knees of Ophiuchus. Zeta Ophiuchi is a speedy star; it moves about 67,000 mph (30 kilometers per second) compared to background material. (The sun only moves at 43,000 mph, or 19 km/s). A red giant about 170 light-years distant, Delta Ophiuchi (Yed Prior), a red giant 170 light-years distant, and Epsilon Ophiuchi, a class G giant 108 light-years distant, form the snake charmer's left arm. 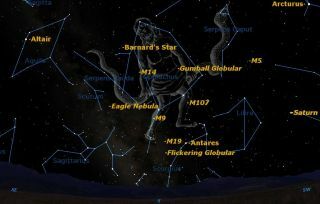 Ophiuchus is home to a number of star clusters, including M10, which is only 20,000 light-years from Earth. It has a magnitude of 6.6. Ophiuchus also houses Kepler's Supernova, also known as Kepler's Star or Supernova 1604, as it was discovered by German astronomer Johannes Kepler in 1604. He tracked the supernova for a year and its remnants are still studied today, as it was the most recent supernova to be observed with the naked eye. The nebular complex Rho Ophiuchi is about 460 light-years from Earth, and a popular target for astrophotography. It's home to a star nursery. A notable potentially habitable planet in Ophiuchus is Wolf 1061c. It's a rocky planet that lies in the habitable region of its star and is only 13.8 light-years from Earth. As is the case with all of the Zodiac constellations, Ophiuchus was recorded in the 2nd century by the Greek astronomer Ptolemy, and the name is Latin for "serpent bearer." The snake is often associated with doctors, so Ophiuchus is often associated with healing images. The Romans associated the constellation with Asclepius, who learned the secret to immortality by watching one serpent treat another serpent with healing herbs. Zeus killed Asclepius with a lightning bolt because he didn't want everyone to be immortal, but later honored his good deeds by giving him a spot in the heavens. The Babylonians associated the constellation with Nirah, a god who was sometimes depicted with a human upper body and legs that were serpents. Ophiuchus is the 13th sign of the Zodiac in astrology (which is not a science) and represents those born between Nov. 30 and Dec. 17. NASA's Stardust mission captured possible samples of interstellar dust that came from the direction of Ophiuchus. The craft's collector tray was positioned so it could catch bits of Comet Wild-2, while the opposite side of the tray pointed toward Ophiuchus. Stardust returned to Earth in 2006 and preliminary analysis of the tray uncovered evidence of interstellar dust in 2014. Brown dwarfs — sometimes called "failed stars" because these objects were just a little bit too small to achieve nuclear fusion — have been studied in Ophiuchus. More than two dozen brown dwarfs were found in a single survey in 2011, which spanned star clusters in both Ophiuchus and Perseus. In 2012, research on brown dwarf ISO-Oph 102 suggested there would be enough grains in the disk surrounding it for Earth-sized planets to form. In 2017, scientists found methyl isocyanate — a key building block for life — near the young triple star system IRAS 16293-2422 in Ophiuchus. Five years before, scientists found "space sugar" in the same system — glycolaldehyde, which is associated with the formation of RNA — another building block of life.